Graffiti, once the trade of thugs and unruly teens, is having something of a second coming in the Middle East. Could graffiti be the new hieroglyphics? Used by the ancient Egyptians to record the events of the day, graffiti is the new public diary of choice. And with the never-ending cycle of change and conflict in the region, there’s no shortage of things to paint about. If the world is a canvas, then the recent spike in graffiti art worldwide can be seen as an attempt to make life more colourful. A burst of vibrant spray paint, depicting regional events or simply just a beautiful scene, can act as an antidote to otherwise bleak political times. Increasingly, in the face of ever-changing political systems and tumultuous sectarianism, many are turning to art as a form of self-expression. Artists feed on the world around them and there is plenty of brain-food in the Middle East at the moment. Although the Cairo streets are becoming famous for their protests, there’s a new, up and coming phenomenon - the streets are decked out in colours, murals, slogans and other splashes of artwork that contextualise the ongoing crisis in a world removed from CNN news reports and death tolls. Beautiful street art may be pouring out of Cairo currently but it has a long way to go before it catches up with the cultural, cosmopolitan haven of the region - Beirut. Professionals in their own rights, Beirut’s graffitiers are giving the streets a human touch with their polished paintings. 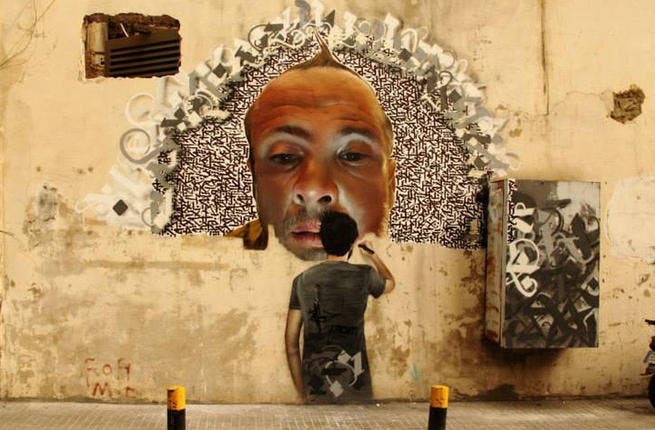 Although still a risky procedure, the high level of skill of those spray-painting around Beirut has given the artists some legal leeway and the city is all the better for it. One cannot discuss street art in the Middle East without mentioning perhaps the most potent combination of them all: Bethlehem and Bansky. Brit-based and infamous the world over, Banksy brought his unique take on both street art to the separation wall that runs between Israel and the Palestinian territories to the region. Instantly iconic, Bansky, through the masterful spraying of a tin of paint, brings the wall, its horrors and connotations to life. A witty take on the most deep rooted conflict of them all in the region, who can argue with Bansky’s Bethlehem buzzwords? ‘Make hummus, not walls’. Actions speak louder than words, but does graffiti speak louder than actions? 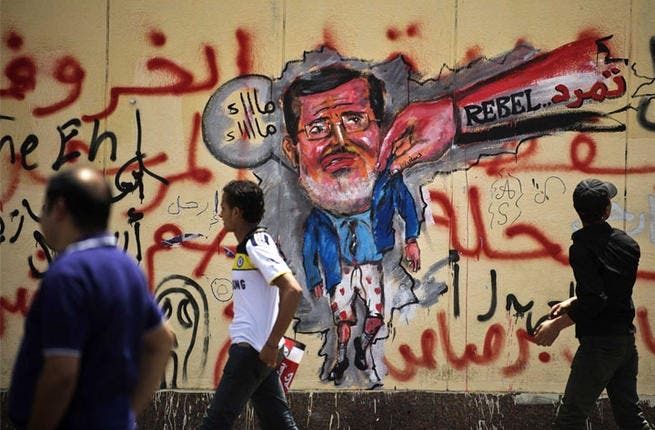 Egyptian artists have decided to take a stand and speak in their own words by drawing graffiti against ousted President Mohamed Morsi on the wall of the presidential palace in Cairo. 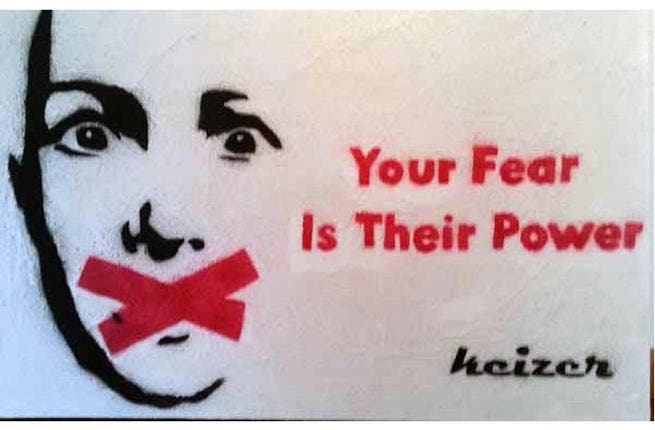 Artist Keizer does not want the Egyptians to back down - he is promoting the revolution by creating an anti-censorship graffiti to encourage all citizens to speak their minds and rally against state oppression. 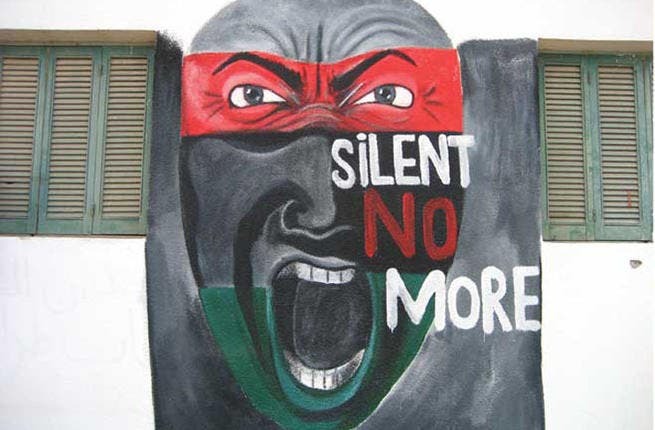 Speak up and fight for your rights urges the “Silent No More” graffiti near Tripoli airport, Libya. Symbolizing that a group of people have more political sway than an individual, this powerful bit of paint is all the more meaningful in the context of the toppling of Muammar Gaddafi in 2011. Beirut never fails to fill its spaces with colors. 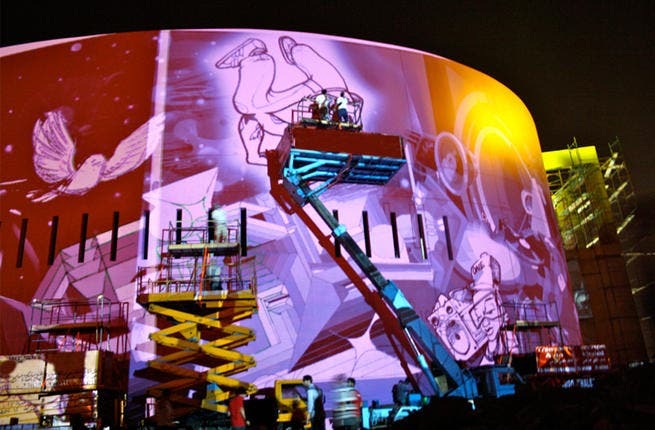 The exclusive O1NE nightclub, which is opening soon, gathered different artists from around the world to help create a street-art masterpiece. Covered in vibrant colours, this mural brings life to an otherwise bland building. Beirut artist Yazan decided to take a new direction in his work by merging with German hyperrealist artist Tasso. The result? Incredibly realistic portraits teamed with Arabic calligraphy that present a powerful image. Look ahead, dream big! 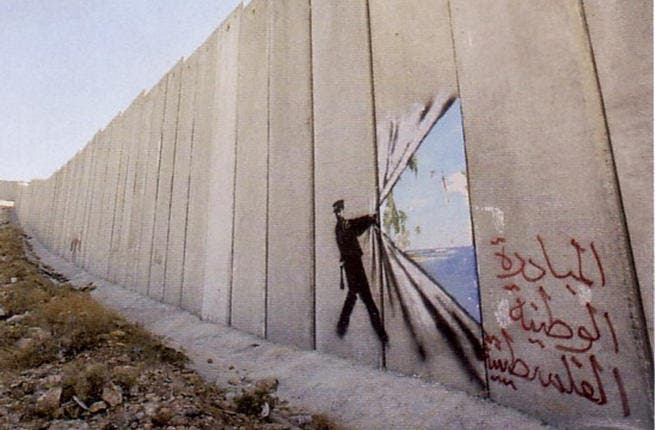 England-based graffiti artist Banksy is encouraging the people of Palestine to stay ambitious by making it seem like there’s a paradise on the other side of the separation, or “apartheid” wall in Gaza. 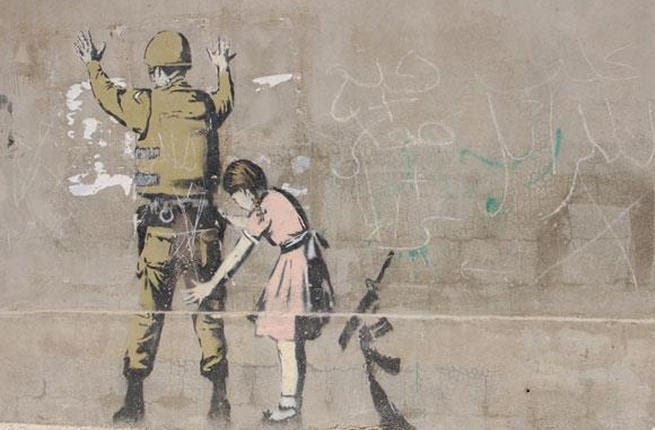 Another Banksy project turns the tables on the Israeli occupation, offering a none-too-subtle commentary on power and violence. The mural gives Palestinians hope that someday other forms of authority will triumph over military might. 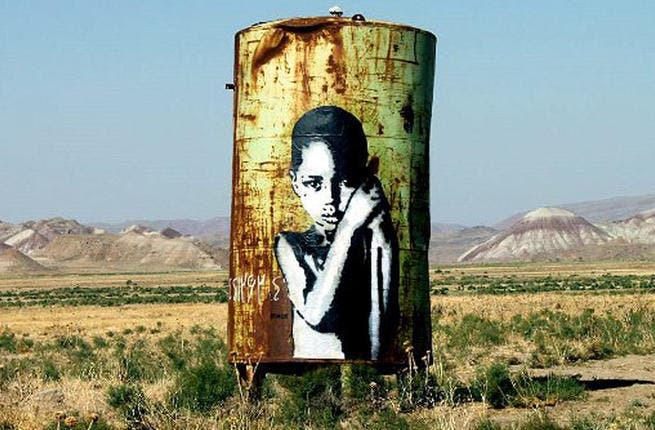 Iranian brothers Icy and Sot use images of child labour in the murals, which are painted across the landscapes of Iran. Creating an uncomfortable effect, these talented brothers show just how powerful graffiti can be.